Get the results you need in a way you can measure. Interact with your customers and soon-to-be customers anytime and anywhere. Build your company’s brand up in a positive way. If your current website is failing in one of these three areas, not only are you wasting money, but you are wasting an opportunity to grow your business online. Look great. First impressions are important. Your website will often be the first interaction a new customer will have with your company. Don’t scare them off with an ugly site. Ensure the user’s (your customer) experience is positive. 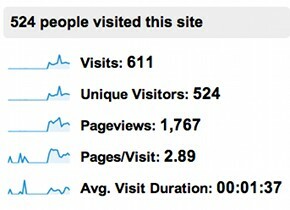 You want visitors to enjoy being on your website. This means you need a site that loads quickly, is easy to navigate, and clearly communicates information. Get results. The bottom line is your website needs to deliver. Whether it’s sales, subscriptions, Facebook “likes”, or something else, your website needs to act as a funnel that pushes vistors towards your desired destination. It takes a lot of different skills to put together a compelling website. 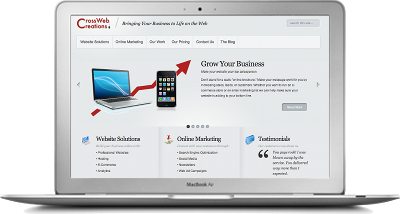 CrossWeb Creations has the experience in each of the critical areas of web design. Graphic Design: Modern and professional looking graphics are vital to establishing online credibility. We can help with all your graphic design needs, from logos to images. Copywriting: Your website needs to sell, whether it’s an actual product or it’s your brand. Effective copy communicates information clearly and turns visitors into customers. Photographs: High quality pictures are worth a thousand words and are vital to an effective website. We can help you find the pictures you need to complete your website. E-Commerce Setup: Wouldn’t it be nice to have a cashier ringing up sales 24 hours a day? With our e-commerce package, you can turn your website into an online store. Business Specific Functionality: Each business is unique and requires different things. Our approach to web design has always been to customize the site to our clients specific needs. We’ll build you what you need, and nothing that you don’t. 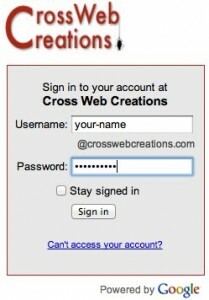 With CrossWeb Creations, we build sites that are customized to your specific needs. No matter what kind of business you run, we can design a site that will fit the look and feel of your business with the functionality you need. Below you can see some examples of designs that would be appropriate for different kinds of businesses. It’s no good having a website if no one can access it. You need to find a web host for your site. This means placing your site on a server that is online and running 24/7 to hold so that others may visit it. CrossWeb Creations takes care of all the technical requirements needed to host your site on high performance servers located in a state of the art data center. The advantages of a data center are security, reliability, and performance. The facility is secure, with diesel powered backup generators in case of emergencies. The network is monitored 24/7 with staff on hand to ensure your site is always accessible. Maintain the credibility you’ve earned through your new website with custom email addresses. You no longer have to settle for emailing customers with a hotmail account. Now you can easily project a professional appearance with a custom your-name@your-company.com email account. Unlimited aliasesAn alias is an additional email address when a user can receive emails. For example, emails to both ben@crosswebcreations.com and info@crosswebcreations.com both go to the same inbox.